At £50 the Totem Vaporizer just about squeezes into the increasingly competitive budget vaporizer category. In my experience, budget vaporizers are more likely to be a miss rather than a hit. 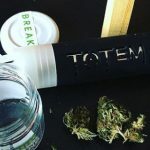 However, I was keen to give the Totem a try after reading it was indestructible and offered hybrid heating – unique for vaporizers under £50. It has been toated as a great vape for parties due to its ability to stack them for double the hit. Lucky for me, i have a friend who has one two. Charlie and I gave it a go over the weekend. 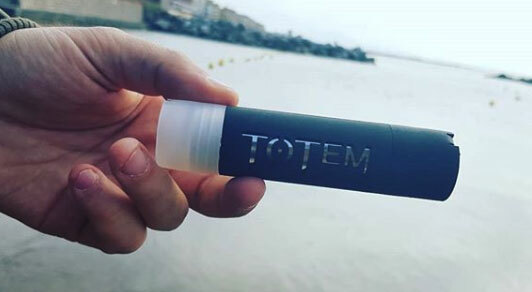 The Totem’s best attribute is its durability which makes it a vaporizer to conisder if portatilbiy is important to you. I’m yet to subject my Totem to any extra-ordinary drops but the body of the vaporizer is made out of a rubber so thick and tough that I have no doubt that it can take more damage than a typical vaporizer. I did however test its claim to be waterproof. This morning I nervously submerged the Totem into my kitchen sink. After drying it off, I powered it up and it still worked! 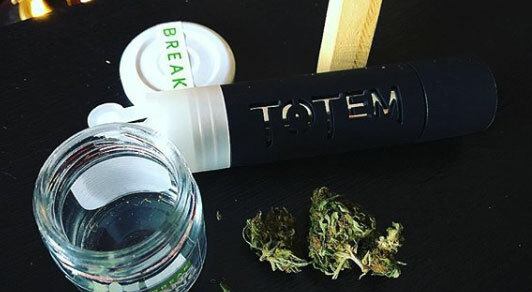 All the ports have plugs that fit very tight into the device as long as these are plugged in the Totem is indeed the world’s first waterproof weed vaporizer. What a time to be alive! Personally, I need a vaporizer to be idiot proof and intuitive to use. Anything more than three buttons and I’ll struggle to operate it when I’m stoned. Thankfully the Totem is really easy to use. It is operated solely with one button. You turn the device on my holding the button for 3 seconds and hten you can change the temperature settings by clicking it once. Can’t get much more simple than that! The Totem has limited temperature settings. Unfortunatley, the Totem as just two temperature settings – 200c and 210c. This is really dissapointing. I often being vaping cannabis at temperatures as low as 170c before slowly winding up to the high temperatures. Being limited to just two high temperatures limits users the ability to tailor your session. Yeah, silicone may be great at not conducting heat and avoiding lip burn but it feels so unnatural between your lips. Yuck! It is NOT a hybrid vaporizer. The biggest advantage of this vapes features was its hybrid heating system. However, as far as I can tell the claims that Totem offers hybrid heating do not appear to be true. The oven is a standard conduction ceramic oven found in most budget vaporizers such as the Black Mamba. There’s nothing wrong with this; I love the Black Mamba and conduction is just fine. However, the Black Mamba is £20 cheaper than the Totem if you look hard enough! Stacking the Totem is a pointless gimmick. It is not as easy as the marketing suggests – trust me! I really wanted to enjoy stacking my Totem with a friend as it reminded me of doing blow backs as a teenager with my very first joints. I can only describe this as awkward and I’m not sure at which point two adults would want to do this. Yes, the hits were bigger but you’re also using double the weed. Is the Totem a gimmick or the real deal? Unfortunately, it is a gimmick. This is the first time I’ve ever written a review of a dry herb vaporizer where I have had more negative things to say than positive. The fact is, there are plenty of budget vaporizers that perform as well or better than the Totem such as the Flowermate Aura, Herbstick Eco or the Black Mamba and these devices are £15 – £20 cheaper too. Unless you’re extremlye clumsy or work in extremem conditions I can’t see any reason at all why you would purchase the Totem Vaproizer over other models. There is clear potential for future iterations of the Totem to be great; it really is shock proof and waterproof. I have total confidence you could take this vaporizer to the wettest, muddiest Glastonbury and it will come back in one piece. The question is would you want to use it again after that? !